A very exotic looking plant for a cool climate, with silvery/blue, fleshy leaves and quite extraordinary flower spikes. 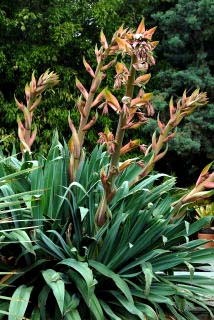 Beschorneria yuccoides subsp. yuccoides is a member of the Agave family, and originates in pine-oak forests in Mexico (S. Hidalgo) at high altitude - 3500 m (11500 ft.). This plant tolerates a great deal of wet and cold, and can be grown in almost any well drained site in the south or west of the British Isles.